On my first post I declared that I would write about marine mammals, but things have changed since then and now I hope you also welcome posts about the microbiology of elephants. To make the transition easier I will show you a picture of a baby elephant. Why I am studying elephants? I was lucky enough to be given an NSF GRIP award. The goal of GRIP is to partner students with federal agencies. A great opportunity for me since one of my goals has been to work at the Smithsonian. I looked for researchers at the Smithsonian that were taking GRIP students and working with viruses. The lab that peaked my interest was at the Smithsonian National Zoo and works on elephant endotheliotrophic herpes virus (EEHV), a herpesvirus that was detected as fatal only in 1995. Since then about eight different types of EEHV have been detected, but EEHV1 is the most pathogenic. This virus is specifically deleterious to young elephants and can progress to death within 1-7 days after symptoms arise. It has mostly been found in Asian elephants, but there have been some accounts of EEHV African elephant infections. My project sounded pretty amazing. I would go to the Smithsonian to get some molecular biology training and then fly to Nepal, live for 4 weeks in Chitwan National Park, and check elephants for EEHV; thus saving the baby elephants!!! To sample elephants I will take trunk wash samples since its one of the most effective ways to test elephants for this virus. Basically, a veterinarian pours some saline (salt and water) down an elephants trunk and the mahout instructs the elephant to blow it back out into a container. After a two week training at the Smithsonian, I packed up my molecular and fieldwork bags and landed in Kathmandu, Nepal. My plan was to collect samples the week I landed. Two and half weeks later and I just collected my first set of trunk wash samples. I declared them the most beautiful thing I’ve seen in Nepal. Not that Nepal is not a beautiful country (e.g. picture below), just that the hurdles to get these trunk washes illuminated my tubes of samples with a magical essence. In addition to working with the Smithsonian, I also wanted to develop my fieldwork skills. So why not attempt fieldwork on a topic I just learned, on field techniques I am not trained to do, in a country where I don’t speak the language, and where electricity is sparse. Needless to say many problems occurred, from permits, to miscommunication about the support available to me in the field, and socioeconomic problems. 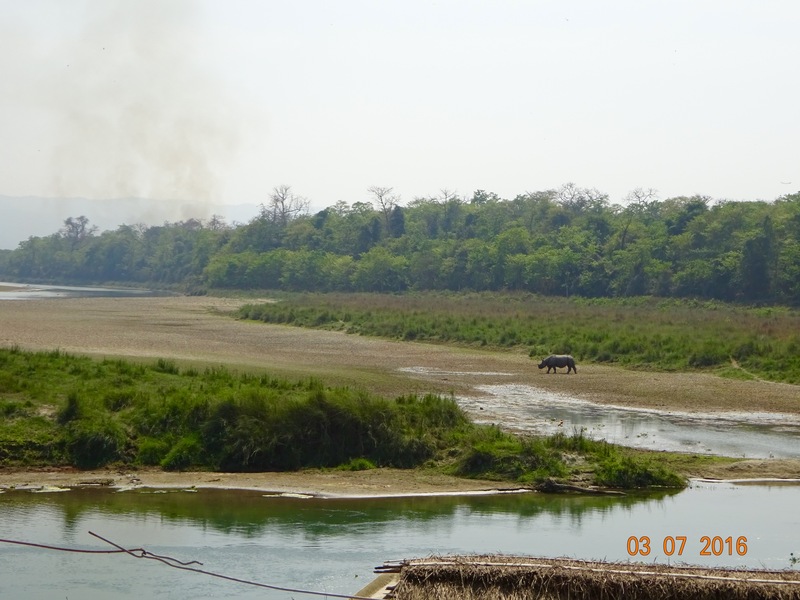 While I have been able to manage many of the problems because of the help of local Chitwan people and the support from NTNC, the socioeconomic aspect of this experience has been the most difficult and thought provoking. I think I used the word “socioeconomic” in almost all the proposals I wrote on this project, but I had a limited understanding on how my project could affect the economy or society in Chitwan’s elephant industry. I thought my research would provide a free healthcare service to the elephants of Nepal and people would be mostly enthusiastic about my study, right? Wrong. I was advised to work with elephants that are privately owned, which are mostly used for tourism. 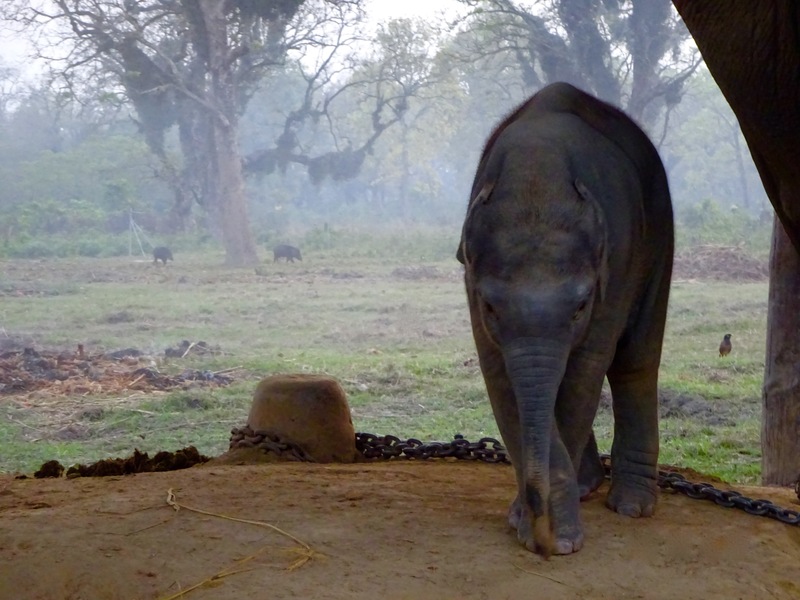 While I have not spoken with all the owners, I have talked to some of the major members in the committee and the consensus from the ~45 elephant owners has been that my study would be a burden to them both economically and socially. Why do they think this, you ask? Their hesitance comes from a previous study conducted to survey elephants with Tuberculosis (TB). A bacterial disease that infects many mammals including humans and elephants and is transmitted through the air. I was told that elephants that were diagnosed with TB could no longer partake in tourist activities (to avoid transmitting TB to people) and were not allowed into the forest (to avoid transmitting TB to the wildlife) until the elephants were treated for TB. Now it is seen as an economically poor decision to have scientist look for a pathogen in their elephants, because they risk losing money from tourism and are forced to treat their elephants. These consequences were especially troubling, because besides the diagnosis their animals looked otherwise healthy. Also, a positively diagnosed animal may be seen in the community as inferior and may decrease the animal’s value. The elephant owners protested that if a diagnosis of an illness is made then the scientist must also provide a solution and treatment. However, I can not provide these resources. Instead I tried to provide education about EEHV to elephant owners. For instance, TB is not like EEHV and should not affect the owners economically. EEHV has not been shown to be transmissible to humans or other animals, so tourism should not be affected. If an adult elephant was diagnosed with EEHV they do not need to be treated, but it is important to know that they can transfer the virus to a calf. 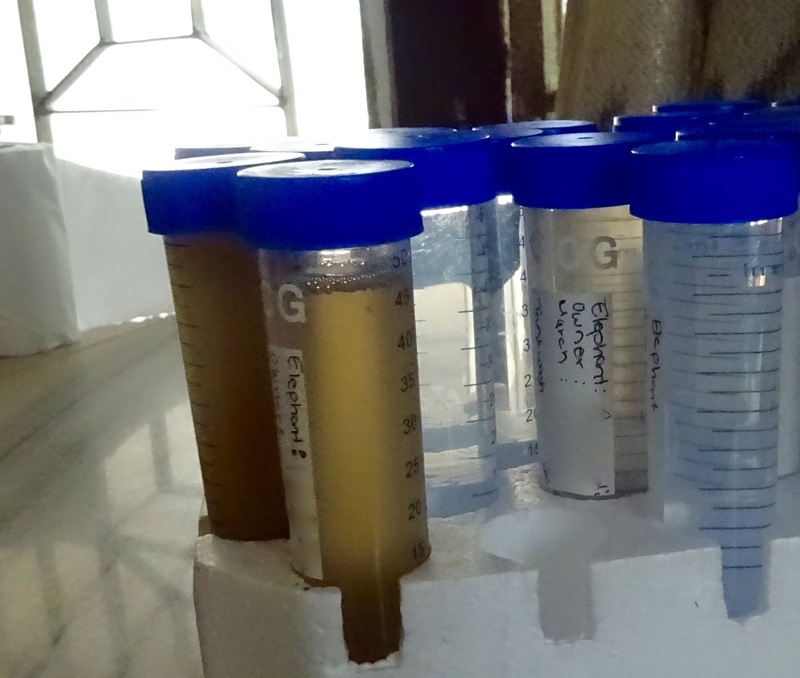 Although, mostly (and I mean mostly) all the elephant owners are skeptical about my research there was enough of them that supported my study; hence the picture of my beautiful sample collection. This entry was posted in Guest post, Lab update, Science, Travel by rosaless. Bookmark the permalink.